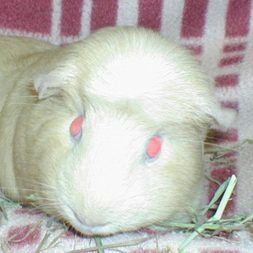 When Kelly Day contacted The Critter Corral in Steger, IL, about adopting Tater Tot, a guinea pig she’d seen on Petfinder, Rose, the founder, asked if she might consider Coco, a piggy with two things going against her chances of being adopted – a head tilt and pink eyes. Kelly had adopted from the rescue before and always liked to take a pet that had been there the longest or one who stood the least chance of being adopted, so she didn’t hesitate. Coco’s head tilt and pink eyes don’t make her less lovable. 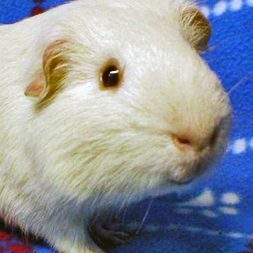 March is Adopt-a-Rescued-Guinea-Pig Month. Learn more about these small furry pets and consider adding one to your family. Petfinder has about 700 listed for adoption at any given time. Find the nearest ones to you.